This section provides an introduction of Lorentz Transformation, which maps coordinates of an event in a stationary frame to a moving frame under the special theory of relativity. Now we can look at the second contribution from Hermann Minkowski in constructing a geometric model called Minkowski diagram to support the special theory of relativity. Minkowski diagram is closely related to Lorentz Transformation. So let's start with the Lorentz Transformation first. What Is Lorentz Transformation? Lorentz Transformation is a transformation formula that maps coordinates of an event in a stationary frame to a moving frame under the special theory of relativity. Bob on the ground uses the ground as his reference frame (x,ct), where x is the space coordinate and ct is the time coordinate scaled by the speed of light c. In order to simplify the discussion, only 1-dimension space is considered. Amy on a moving train uses the train as her reference frame (x',ct'), where x' is the space coordinate and ct' is the time coordinate scaled by the speed of light c.
The origin of (x',ct') is adjusted to be at the same location as the origin of (x,ct). That is, we have (x',ct') = (0,0) when (x,ct) = (0,0). The train is moving at a constant speed of v relative to the ground. 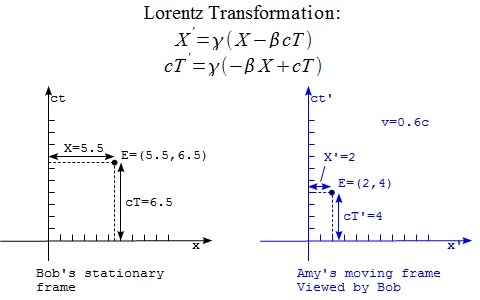 For example, assuming the train is moving at the speed of 0.6*c, an event E at (X,cT)=(5.5,6.5) on Bob's light cone would be observed by Bob in Amy's frame as (X',cT')=(2,4) based on Lorentz transformation #3 and #4.